Sneakers are so trendy right now and they are the new perfect accessory to finish off an outfit. Some of the sneakers we’ve seen are platformed with pretty pastel colors or have an all white look. 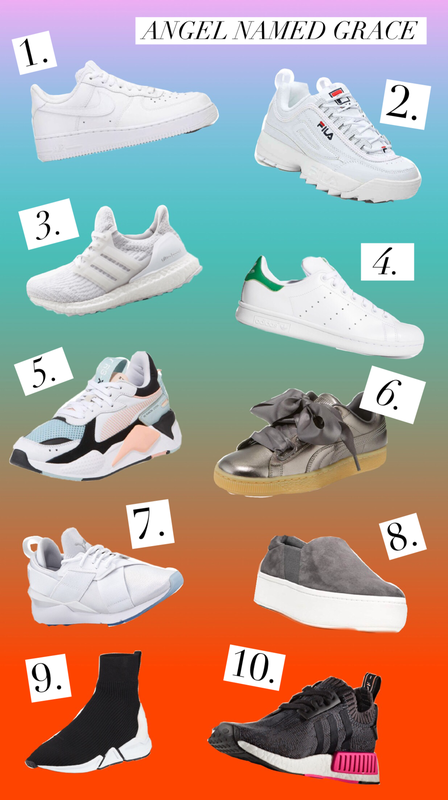 We made a list of our fav sneakers right now and wanted to share these stylish kicks with you! Scroll down to see the list and click on the name of the shoe to buy! The Nike Air Force 1’s are a classic and one of my favorite pairs at the moment because they go with any outfit. It has a nice , simple platform that gives you the perfect height. These Fila shoes are perfect for you if you’re into the “dad sneaker” look. They are so stylish and can make any outfit. Adidas Ultra Boosts are so comfortable and are perfect for working out and look good when wearing workout casual clothes. These are some great white shoe basics because it is such a simple, yet cute sneaker. Another pair of dad sneakers, but these colors on this pair is so cute and different from what most people have! These comfy sneakers are so gorgeous and stylish, these are the perfect way to complete an outfit. Cute and simple pair of sneakers with simple, yet pretty colors. These sneakers are slip-on’s from Vince that are so stylish and comfortable. You can easily dress them up or down. These “sneaker” booties are Balenciaga inspired, but half the price! These are so unique and gorgeous and you won’t have to worry about over-spending. A simple sneaker with gorgeous pops of pink- how could you resist? !